Meanwhile, Lizzie has been taking singing lessons. She hates them—she’s really not that good. But her parents decided she needed to “find her voice” and thought this was a great way to do it. Lizzie doesn’t want to hurt their feelings so she doesn’t say anything. Sarah gets the gang to scheme ways to hint to Sheriff Hadley and her mom that they all know they’re together and they want them to get married. Now Lizzie’s really uncomfortable. Why doesn’t Sarah just talk to her mom? To make matters worse, her friends come up with an idea of a romantic moment at the Valentine’s Day Dance that involves a proposal and…a singing Lizzie. Can Lizzie find the courage to put a stop to all this? Or is she going to face her worst nightmare? 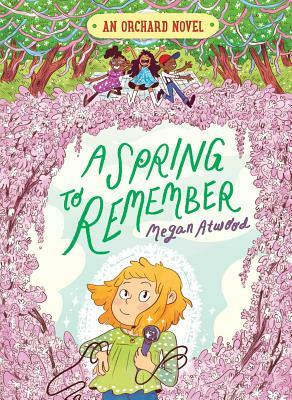 Megan Atwood is a writer, editor, and professor in Minneapolis, Minnesota, whose most recent books include the Dear Molly, Dear Olive series. When she’s not writing books for kids of all ages, she’s making new friends, going on zombie hayrides, and eating as much ice cream as she can. And, always, petting her two adorable cats who “help” her write every book.